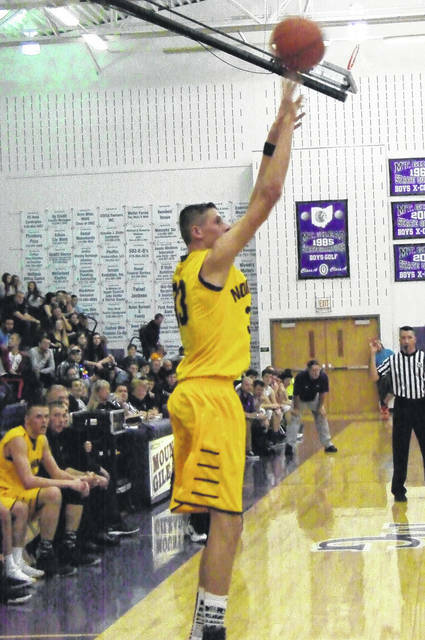 Kyle Kegley launches a three-pointer for Northmor on his way to finishing with a game-high 21 points Friday. 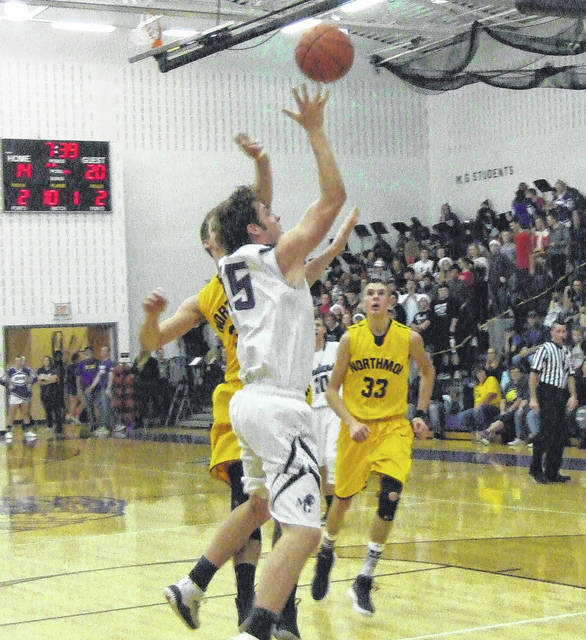 Mount Gilead’s Mason Mollohan goes up for two in his team’s game against Northmor Friday. 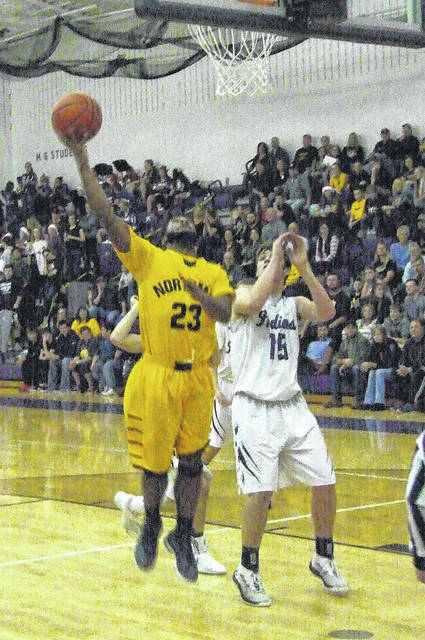 Northmor got 14 points from Demetrius Johnson in defeating Mount Gilead Friday. Northmor withstood a barrage of three-pointers from Mount Gilead to take a 66-51 road KMAC win on Friday. The Indians connected nine times from deep, including four in the first quarter, but Northmor’s height held them to only seven field goals from inside the arc. The Knights jumped out to an early lead after Brock Pletcher nailed a three-pointer to break a 2-2 tie. Demetrius Johnson and Kyle Kegley added baskets to make the score 9-2. MG got a three-pointer from Jason Bolha, but Northmor responded with a basket by Tyler Kegley and three-pointer from Eason Neal to open up a nine-point advantage. MG went on a 9-4 run, as Seth Young had two three-pointers and Bolha added another, but the Knights scored last in the quarter on a putback by Neal to hold a 20-14 lead. Indian coach Tom Cooper noted that while his team gave a strong effort, the Knights simply had too strong of a team. Northmor opened the second quarter with a dunk by Kyle Kegley off a Neal assist. MG responded with a basket by Mollohan, but the Indians then went into a three-minute drought. In that time, Tyler Kegley scored twice and Blake Miller added a basket, as the Knights opened up a 28-16 lead and would still hold an 11-point edge going into the half. After the teams traded scores to open the third period, Kyle Kegley scored 10 straight Knight points to help them increase their lead to a 46-29 margin. Sparked by six points from Young and five more by Mollohan, the Indians fought within a 51-42 score late in the period, but a Tyler Kegley three-pointer to close the quarter boosted Northmor’s advantage back to 12. Northmor was able to maintain a double-digit lead throughout the fourth quarter, as Tyler Kegley scored to open the period and MG would not be able to get closer than 12 points over the final eight minutes. Cooper noted that Northmor’s height advantage played a big role in the rebounding game. Still, after the game, Cooper was pleased with how his team competed against Northmor. Mollohan led the Indians with 19 points, while Bolha hit three three-pointers in scoring 15 and Young added 14. Northmor got 21 from Kyle Kegley, 16 from Tyler Kegley and 14 from Johnson. Ruth also had complements for Miller, who worked defensively against Mollohan, and Neal, who gave the team good minutes off the bench early in the game due to Pletcher getting two fouls. “This team is built so if we have a guy in foul trouble, we can put someone else in and it’s next man up,” said Ruth.